Infiltration is an important process of hydrological cycle and needs to be studied for the proper and efficient management of water resources. Due to scarcity of water, especially in India, the study of various aspects of infiltration is of paramount importance. The rate and amount of infiltration are must to estimate the water requirements for an efficient irrigation system. The infiltration capacity is dependent mainly on soil texture, soil structure, vegetative cover, soil compaction, rainfall time, existing soil moisture content, etc. Infiltration characteristics can be estimated either by cylindrical infiltrometer method or by using mathematical models. The paper presents a review of research undertaken in the area of estimation of infiltration rate/capacity by using experimental methods and mathematical models, highlighting the major findings of the past studies. 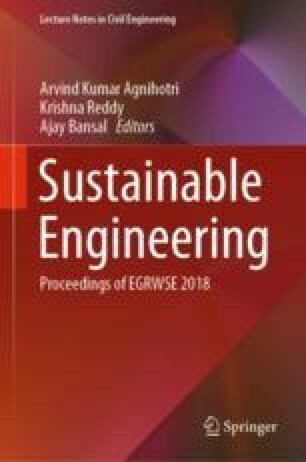 It is expected that outcome of this article may be utilized for selecting an appropriate technique for analyzing the problem of infiltration rate/capacity, which is urgently required for the management of available water resources in India.